Smaller than some other high end lines. Very well kept. Prompt room service. Nice balcony. Small bathroom and shower but adequate. 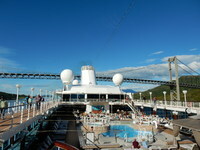 Small and dingy at the moment,refit next year, but with good storage and balcony. Well serviced. The shower and toilet are very small but well maintained. Best for the average size person only! 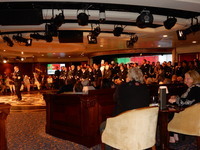 Great location any cabins nearby will satisfy, mid ships. 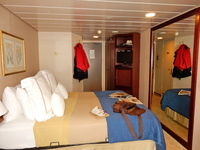 Typical small stateroom which made me want to be out of the stateroom and in public areas. Clean and tidy but small bathroom. Cabin 7082, great location, near stairs and laundry. 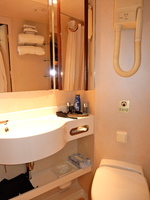 Typical Azamara balcony cabin, very small bathroom. Adequate storage, could use more drawers.